Ricky is a problem kid from the city streets thrust into the lush green countryside of rural New Zealand. He initially rejects every caring advance directed his way by his new foster ‘auntie’, rebuffing all niceness and threatening to run away, but even streetwise kids struggle when there are no streets. Then just as things were looking up, Auntie dies, and Child Services arrive to collect him and take him back to the city. Back to state sponsored hardship and struggle. Again Ricky ain’t having it, and this time he has an unlikely ally, Auntie’s boyfriend Hector (Sam Neill), a surly and quiet loner who is obviously also dealing with loss in his own way. Despite seemingly having nothing in common, the duo quite literally head to the hills together, staying always on the move Rambo style, while Child Services’ helmed search parties attempt to find their scent. The chalk and cheese dynamic between the boisterous and incessantly jabbering Ricky and the grizzled and stoic Hector underpins the film, with Hector’s disbelief and doubt of Ricky’s boasting providing many highlights. 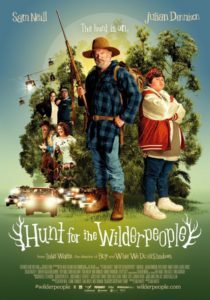 Despite the serious undertones of death and a continuing theme of kidnapping, Hunt for the Wilderpeople is funny, inventive and often uplifting, and probably nothing like you expect. Final Rating – 7.5 / 10. A unique love story between an old man and a young boy that will give a smile for anyone teenage and up.